The original Marvel Comic Star Wars books have a certain nostalgia to them. The stories themselves are not classics by any means but they were full of colorful and fun adventures by the characters from the films. 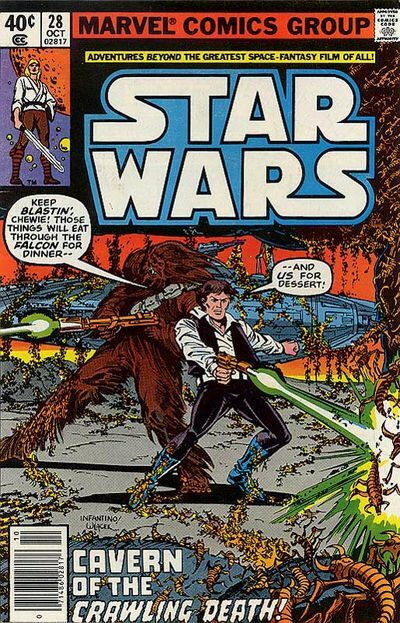 This cover features Han and Chewie front and center with the classic 80's word balloons on the cover. The interesting note here is the inside story is titled "Whatever Happened To Jabba The Hutt?" which is of course the human gangster Jabba from the early deleted scenes from the film before he became known as the slimy creature we know today.